These days have been loaded with the gamete of emotions ranging from sheer joy to deep mourning. Both our grandfathers passed away within 2 weeks of each other. Daniel’s grandpa faded slowly and peacefully, while the passing of my Pampo was sudden and unexpected. My brother and his wife had a baby boy, and we had the opportunity to spend a week with my immediate family enjoying each other. We said farewell for the umpteenth time which is always emotional. There is a partnership involved when Daniel and I say farewell to someone. We take on supportive roles that fulfill the needs of the other. That said, farewells continue to be difficult for me. And while each farewell I’ve said this month has been completely different than the next, they have all been emotion-filled and caused me to reflect on my life. I feel like my whole life has been one big struggle to keep up with what I thought I needed to be, when in reality God has always been ready to meet me wherever I am. What a silly and exhausting way to live! It has taken almost 31 years, 7 years of marriage, and 9 months of motherhood to finally understand that I can no longer put myself into some kind of mold, and still expect to see and appreciate God’s blessings for what they really are – opportunities to be free and open to whatever life is at any given time. So here’s to being ok with re-prioritizing. Here’s to being ok with the fact that not everyone will understand or agree with what my priorities are and how I set them. Here’s to not being disappointed in the fact that I’m not who I aim to be. Here’s to knowing that I’m working on it in ways that help me keep my priorities in place. Here’s to showing God just how much I love Him and am grateful to Him by using the tools He gives me and appreciating the seasons He accompanies me through. Here’s to not over-extending myself in ways that make me lose focus of the things that matter most to me. When Grandpa H. passed away, when we received word that Elijah had been born and then that Pampo had died, I learned different lessons from all of these things. I plan on using these lessons to wise up and stop struggling. My relationship with God is constantly evolving and solidifying. So is my relationship with Daniel. Gideon is growing, learning, and developing at such a rapid rate. I don’t have time to struggle, and I feel so liberated. All of this is not to say that I refuse to go through tough times, or that I somehow have it all figured out as to how I will deal with difficult situations. All of this is to say that I plan on targeting tough times with a whole new perspective, and leaning less on my understanding and more on His to deal with difficult situations. I already said Gideon is growing at a fast rate. Every day he is doing something new and exciting. I’m ready to embrace just how important my role is in his life, and enjoy it! 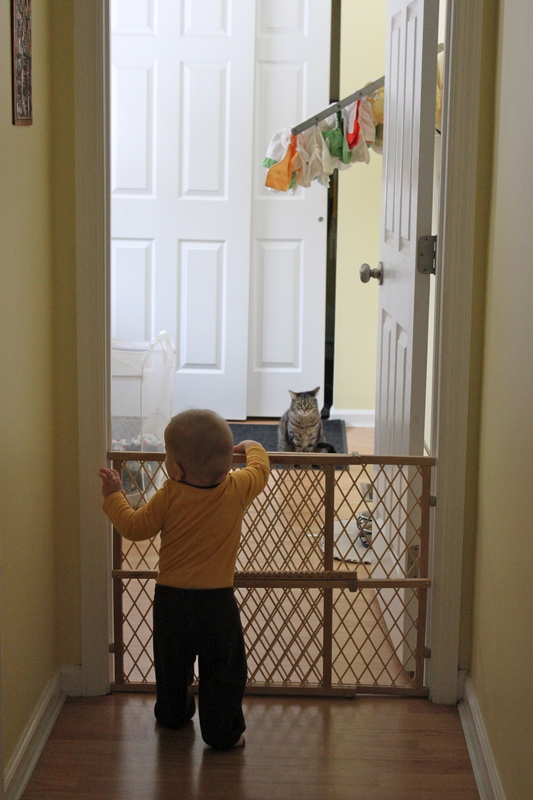 speaking of changing times: baby proofing time is at hand! You may be way ahead of me, you may still be working things out like me. God meets you there! Be comforted by that. Soundtrack: Eddie Vedder and Phil Collins’ covers of Bob Dylan’s “These Times They Are A-Changing”. Appropriate, right? When I walked into the nursery this morning, I melted into a puddle of mush on the floor. It’s not uncommon for Gideon to start the day with adorable pillow face, but this morning his adorableness took on a whole new dimension. First of all, he had puffy morning eyes. Second, he has a little bruise on his forehead from banging it on the deck door yesterday. And third, he had his first case of bed head! See for yourself! Daniel was off of work today, so we spent most of the day playing and relaxing at home. While Gideon napped, Daniel and I stole some snuggle time in bed and enjoyed some hot chocolate and Hulu Plus reruns. Daniel distracted Gideon for a while so I could catch up on some cleaning. After freshening up we headed out for dinner with some dear friends of ours. One of my closest friends, Chantelle, made some of her delicious butternut squash soup and was kind enough to share some of it with us. I had 4 or 5 bowls of it, no joke. We had fun sitting around the table visiting and Gideon had a blast playing and petting her dog, Bree. Chantelle told us a story about an encounter she had with a neighbor the other day while she was out for a walk. Chantelle’s neighbor made some rude comments, and Chantelle’s feelings were hurt. She told us that she was not pleased with her initial response. In order to mend whatever wrong Chantelle felt she’d done, she left a note of apology on her neighbor’s front door. The very next day Chantelle found an apologetic response from her neighbor on her front porch. Now they smile and wave at each other in passing. The main reason Chantelle felt she needed to correct her mistake is because she takes her faith and her christianity that seriously. It’s a small, sweet story. But the root message and impact of it is very strong in my life. It’s so easy for me to get comfortable in my life, and shrug off missed opportunities to emulate God. One of the reasons I admire Chantelle is because she is always very intentional in the messages that she sends – whether via body language, words, or writing. She does not take God’s positive impact on her life lightly and wants to make sure that everyone sees the effect He has in her life. In some ways I’m a perfectionist and very Type A. I am a slacker in others. I think that if I envision every single aspect of my life as a way to profess God’s love and my gratitude for his blessings, I will become more intentional and truly productive. Do you have trouble being intentional in some aspects of your life? What do you do about it?